Aster White Upland Aster Ptarmicoides is a low-growing herbaceous perennial. Also known as Upland White Goldenrod or Solidago Ptarmicoides this wildflower can be started from seeds indoors or outdoors. The established Upland Aster forms mounds of goldenrod-like, shiny dark-green, willow-like foliage that are literally covered with masses of white flowers in August and September, and the silvery-white seed heads carry the show into the fall. The blooming Upland Aster attracts butterflies and bees. 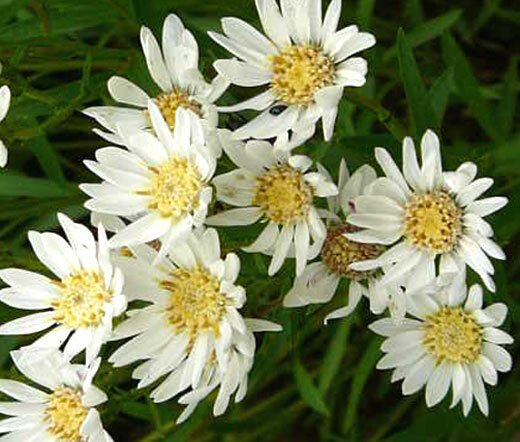 Aster White Upland it perfect for sandy hillsides, rock gardens, because it will grow in the hottest, driest sandy soils that most other plants find hostile. This Prairie Goldenrod tolerates drought perfectly and requires at least a half day of full sun. White Upland Aster has the erect and rigid floral stems that make it a good cut flower.